Dave Morgan explains how a magical garden display will benefit those suffering from Parkinson’s Disease. In 2003 a chance conversation between keen gardener Alan Nokes and another gardener and near neighbour, John Morgan, who both live in Braces Lane in Marlbrook, made them realise that both had dreamt of opening their gardens to the public under the National Gardens Scheme (NGS) for many years, yet neither had done anything about it! So together they contacted the NGS and after a brief assessment they were delighted to hear that they had been accepted and could open the following year. The small group of two soon became three with the addition of John’s brother’s garden, just around the corner – and since 2004 these gardens have raised more than £50,000 for the NGS (which passes about 80% of its income directly to charities such as Marie Curie and Macmillan) and other local charities. However, a few years ago the NGS decided to introduce a “guest charity” which they would also support over a period of two or three years, and the current guest charity is Parkinson’s UK. Somewhat ironic, therefore, that earlier this year Alan (who also creates and manages the NGS “Yellow Leaflet” for Worcestershire) was diagnosed with early onset Parkinson’s Disease. That made the link between the NGS and Parkinson’s even more relevant for him and his wife, Lynn. So much so that, after opening twice on Sunday afternoons this year for the NGS, they have decided to open once more – but this time as an “evening opening” specifically to raise money for Parkinson’s UK. Alan and Lynn’s “Round Hill Garden” at 24 Braces Lane is a semi-formal and neat garden incorporating a Mediterranean-style patio, together with some tropical plants and a large pool with a bridge. There are sweeping lawns past well-stocked herbaceous borders to where it appears the garden finishes, but pass through the arch and you will find yourself in a large vegetable area with excellent use of raised beds, together with several greenhouses and an interesting and growing collection of cacti. This is a charming garden, ideal for relaxing in or just sitting and enjoying the tranquillity. On the open night, visitors will also be able to enjoy a free glass of wine (or soft drink) and even purchase hot dogs and homemade burgers cooked on the BBQ. 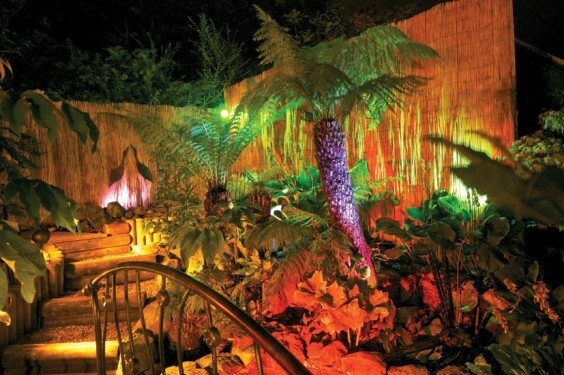 The garden will be open from 7pm until 10pm on Saturday September 6, admission price £5. Get there early to see the garden in daylight, and then stay to see how it changes when hundreds of lights are switched on, giving it a real magical feel. To ensure an enjoyable evening for all, Alan and Lynn have decided to limit the number of visitors in the garden. Visitors can pre-book tickets to ensure entry – which can be at any time during the evening. Any unsold tickets will be available at the door on the night. All monies raised will go to Parkinson’s UK.